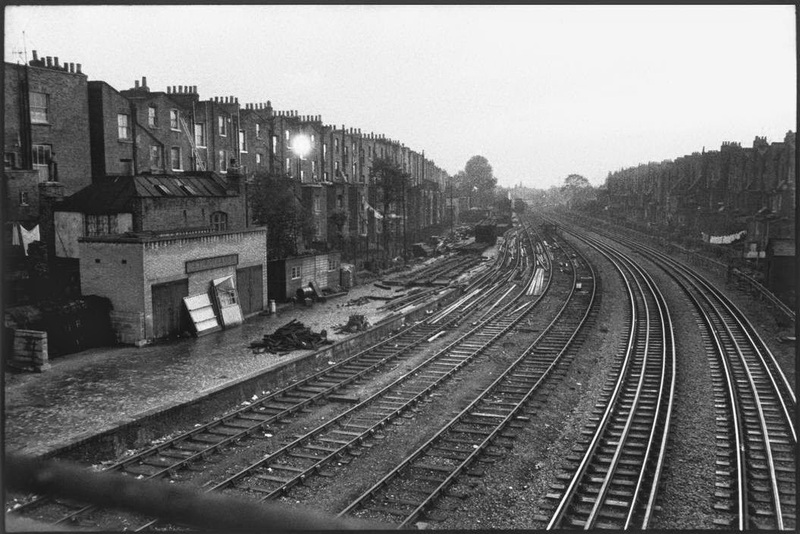 The caption says "Woolwich to Thamesmead railway line 1964" which is clearly nonsense,though the date could be correct. The unelectrified tracks to the left all look to be sidings. It was posted on a London History Facebook page,with the caption as stated. I googled the caption on Google Images and found that it was from a site of photographs of London in the 60s. Since posting,I have been looking at old maps,I think it may be the H&C between Westbourne Park and Ladbroke Grove,before the Westway was built,but would appreciate confirmation. Yup, I'd reckon you've solved your own question. What I would say is that the track layout looks more substantial than what would have been around in the 60's as the track layout was rationalized at some point in the 50's along with resignalling I believe. What a brilliant web site! One thing I did note, it shows 'Wood Lane' station as disused, and the new 'White City' station in use, the survey date on the map is '1953'I just mentioned those for reference, but it still shows the spur link between 'Latimer Road Sttion'and the West London Line in situ. I thought it was out of service from October 1940 due to bomb damage? The website is the National Library of Scotland, and a volunteer produced a programme to allow the tiling of the old maps scanned by the library over a satellite image, it allows the changing of the opacity to allow more or less of the underlaying satellite image to be seen. One problem with this approach is the maps that are scanned are not all of the same date, the link I put up contains maps from 1947 to 1964, it is not always clear where the boundary of the map is... The other problem is with OS maps is they did not always re-survey the area, and so some maps are wrong when compared with photographs or records. The photo looks right for the H&C but it doesn't look right if that makes sense. The H&C was built to broad gauge and standard gauge so the "six foot" was wider! As seen on the remaining stations. But it is how I remember that area before Westway was built. I used to use it most weeks to go to the MRC at Kings Cross. Hrsig's diagrams may not show all hand-worked sidings as they did not appear in signal box diagrams.